For those of you who follow me, you know how eclectic my style is. I mix and match inspirations from all kinds of styles. Even then, I'm not a full representation of a particular style. I have elements that make it a little "off" (so to speak). This outfit shows how eclectic I am. I bought this H&M top some time ago and have worn it in various ways (here, here, here, here and here lol). 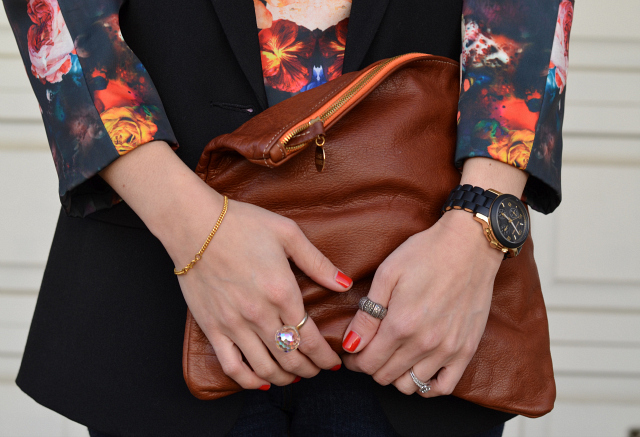 With this look, it's paired down with a dark palette but because of the print, it still stands out. I may or may not run out of ways to wear this top but I'll always be pretty eclectic. HELLLLO amazing shoes! those are beyond - love them and love all of the colors/prints in this look! Well whatever your style is, I love it and think you rock it pretty well. I don't think I could get away with looking near as good as you. =) Love the shoes! Those shoes are really amazing...and that clutch is definitely a beauty! The top is lovely, but those shoes... wow!! I, for one, love your eclectic style. And I love that top and those fab shoes on you! 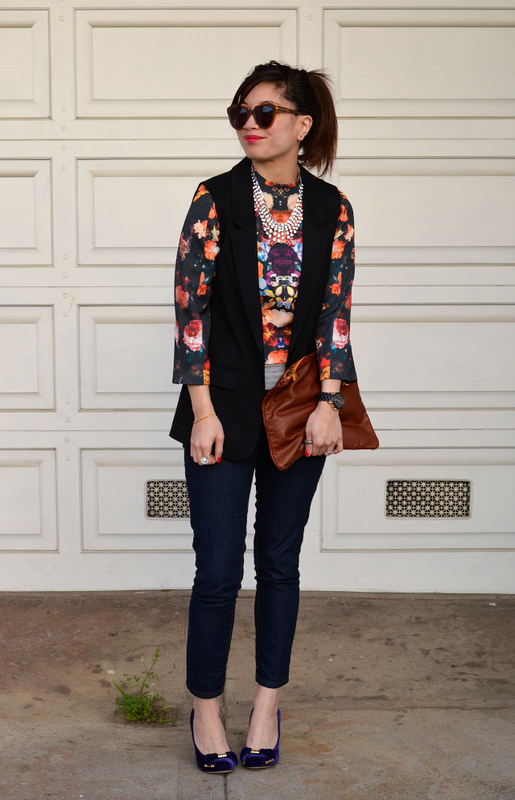 The floral top and heels are fabulous! love this! great print on your shirt and those shoes are soooo pretty! This is such an awesome look! Those heels are beyond fabulous. Wow, amazing top and shoes! 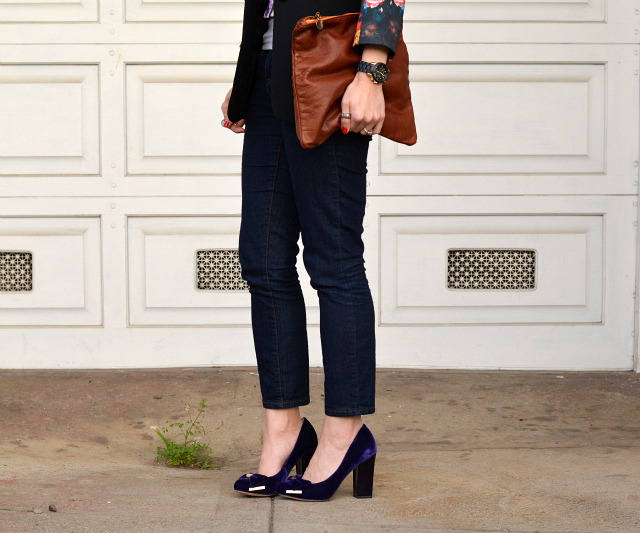 Love the moody florals...and those shoes! Gorgeous, lady! I love this! its so fun and colorful. And the shoes.. showstoppers! This is a cool outfit - the print of the top and the gold accents of the shoes are all cool points of interest! Gorgeous! Love the whole look. Especially the shoes. Such a beautiful outfit and I'm definitely in love with your SHOES! those shoes are amazing!!! so jealous! I love your top and the pump are very cute..
well that is what makes you unique nancy. love the top and those shoes! they're too cute. 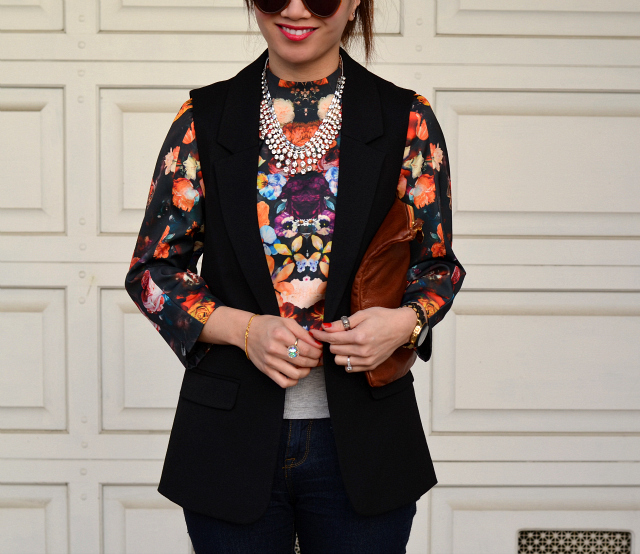 That floral top is amazing! Work it girl! This look is beyond fabulous! LOVE it! such a wonderfully styled outfit!!! i just adore that top with those velvet pumps!! LUSH! That print top is amazing, and I love the purple heels! I can't stop drooling over that necklace - I never find pieces that pretty at F21!! I love the print of your top and your heels are gorgeous! And as for the photo date, LETS DO IT! My schedule will open up more in April, so hopefully a weekend then sounds good right? Thank you for the lovely comment on my blog...I am now following!! What a gorgeous top. I love how colorful this outfit is. Such couture, just love how you have paired it all together. I always so drawn to your eclectic style Nancy! Love your heels! Nancy those blue velvet heels are beautiful! Love this eclectic look:)! I love it with the vest and the necklace looks great with it. Those pumps!! Super super cute look! Great photos, love the style ! Beautiful shoes! I LOVE LOVE LOVE this outfit!!! You are so beautiful and your style is amazing!!!!! adore the top and those shoes, lovely style!! !